This is a Tufts central waste station, where you would bring your recyclable materials and trash. Each central waste station has a recycling bin and a landfill bin. They should always be together! The recycling bin should always have a blue UFO-shaped recycling lid. If you see a recycling bin without a lid, please submit a work order to Facilities Services so the lid can be replaced as soon as possible. 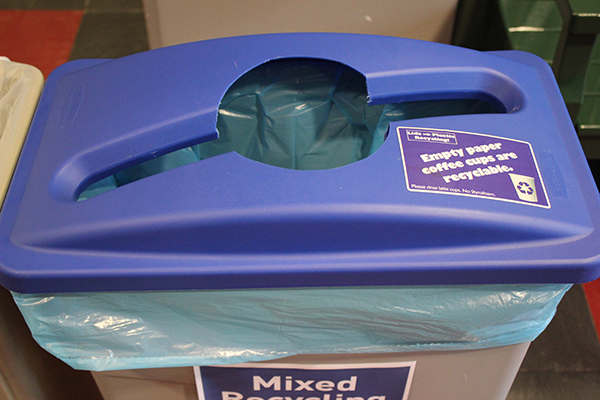 Mixed recycling means we have single-stream recycling. All recyclable items should be placed in the mixed recycling bin: paper, cardboard, hard plastic, metal, and glass containers. Plastic items: Make sure you are recycling rigid plastic items like plastic containers. DO NOT recycle filmy plastics. All soft plastics should go in the trash bin or a Trex specialty recycling bin. Paper/cardboard items: If the item is greasy, put it in the compost or trash bin. Do not put any food or liquids in the recycling bin. Make sure all containers are free of food waste before recycling and that all bottles are empty. For easy-to-read visuals, like the ones previewed below, on what is recyclable at Tufts and according to the Massachusetts Department of Environmental Protection (MassDEP) check out our downloadable wall signs page. All clean hard plastic containers, such as jugs and jars. Wipe or rinse out food waste. Other metal (e.g. coat hangers, pans, random metal objects). These items must be processed separately; submit a service request if you have a large amount of metal to recycle. Jars and bottles only (before recycling, empty out the contents/liquid). Any color of glass is accepted. For information on how to recycle batteries, electronics, ink and toner cartridges, and other items not listed on this page, please view our specialty recycling page. You can also download our recycling guide in an infographic-format. 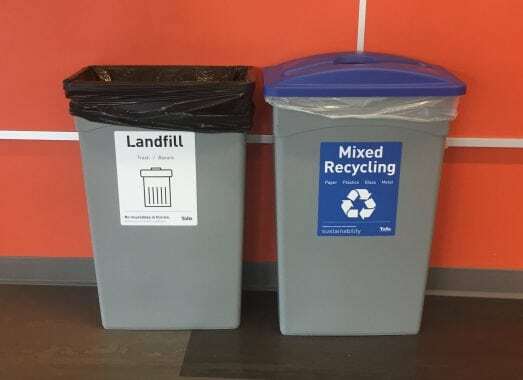 Use it when you need a quick reminder on what can and can't be recycled here at Tufts.